For some time I’ve been tempted to explore Semyon Bychkov’s Shostakovich, despite being lukewarm about his other recordings. The Eleventh, once neglected, now seems rather popular, with exceptional new accounts from the likes of Mark Wigglesworth and the Netherlands Radio Philharmonic (review). Not only is the latter a benchmark reading it’s also a sonic spectacular, in the best sense. 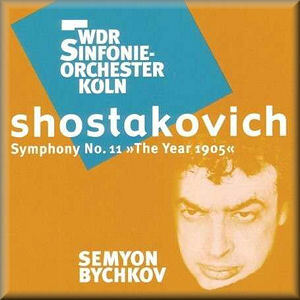 Listening to it in preparation for this Bychkov review just reminded me why I made it one of my picks for 2010; played with such blazing conviction and unremitting drama it’s difficult to understand why this symphony gained its poor reputation in the first place. As with the Wigglesworth, this Cologne recording is an SACD, which gives the first movement ample presence. Sadly, there’s little else, for Bychkov’s discursive – some might say rambling – view of this music saps it of momentum and essential frigidity. Where others are both inexorable and scarifying Bychkov is simply dull; even his players don’t seem terribly engaged. As for Avie’s sometimes overbright sound it’s nowhere near as visceral or as expansive as BIS’s for Wigglesworth; indeed, all the SACDs in the latter’s cycle are class leaders where this repertoire is concerned. The second movement – 9th January – is just as disappointing as the first; it’s hard to imagine a more flaccid response to these alarums and excursions than this. Bychkov shows little feeling for the work’s architecture, over-revving the music and throttling back at will. It’s curiously unsettling, not to say underwhelming, and the playing isn’t too polished either. Not surprisingly, perhaps, the haunting – and haunted – In Memoriam is none of these things. Goodness, in a post-Volkov world how is it possible to misconstrue and misrepresent this symphony so completely? Bychkov brings out the Mahlerian qualities of Tocsin – given as Toscin in the track listing – but then seems content to play up the work’s inherent banality and bombast. No-one who knows this symphony would deny those elements are there, but others harness them to great dramatic/laconic effect. In short, playing it ‘straight’ – as this conductor does – takes us right back to the bad old days when the Eleventh was rarely played. One just has to hear how Bychkov nonchalantly busks his way through that grim, screw-tightening finale to give up on this performance altogether.